Connect the 3.5mm male to XLR female cable with the microphone and your PC or other devices If your PC is equipped with 3.5mm combo headphone/microphone port, use 3.5mm microphone headphone splitter to start recording. Cardioid Pattern and Noise Canceling Technology: This cardioid pickup pattern and the unique low self-noise technology provide a high level recording performance,making the vocal voice crystal clear,crisp and pure.The Cardioid mode allows the studio mic to maintain isolation and prevent feedback,which means it only records sound you want and captures a full texture and tone of sound.The metal mesh outside and the built-in pop filters enable it to eliminate most background noise and pops. Easy Plug & Play and Wide Compatibility: It is easy to install the kit,just plug it in you devices and you could get you own audio.No extra drivers is needed. 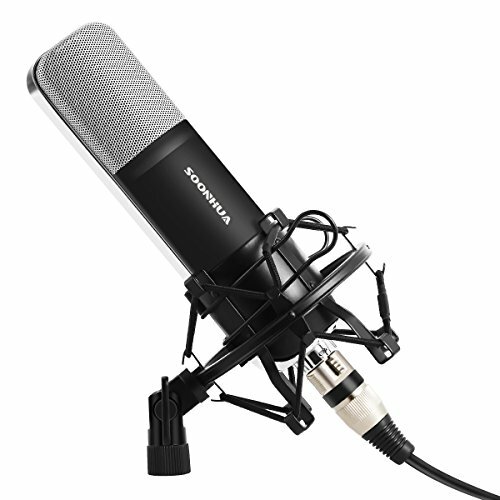 It is compatible with PC,laptops(Windows 7/8/10, MAC),tablets and phones(IOS/Android).You can use the XLR to 3.5mm cable to connect the mic to the audio jack on a Windows PC. A adaptor is needed if your laptop does not have separate headphone and mic jack.For Mac and tablets as well as phones users, you need a sound card to get it work. Great in Both Vocal and Instruments Recording: It is the best choice for professional studio recording works, such as doing vocals, and recording instruments,as well as making live TV/radio broadcasting.Wide frequency response(20Hz-20KHz) makes it perfect for picking up vocals, acoustic instruments:violin, guitar, mandolin, pianos,soft percussion,etc as the condenser mic has the ability capture all the subtleties and nuances of your voice. Multiple Usage for Both Work and Life:It greatly meets you use of recording presentation narration, video conference,online meetings for work.It is a essential tool for YouTuber who need to make video, vlogging,record podcast, add voice over and video commentary,etc.It does a good job for basic internet conversation,you can use it for internet chatting on Skype&Hangouts and gaming on Discord as well as streaming on Twitch. Adjustable Shock Mount and Protective Foam Cover: The sturdy and well-constructed mount reduces the trill caused by vibration effectively.The windscreen not only prevents wind noise and pops during recording vocals,keeping your mic from picking up background noise,but also shields your mic from bumps and also protects your mic away from dust, dirt, debris and moisture.